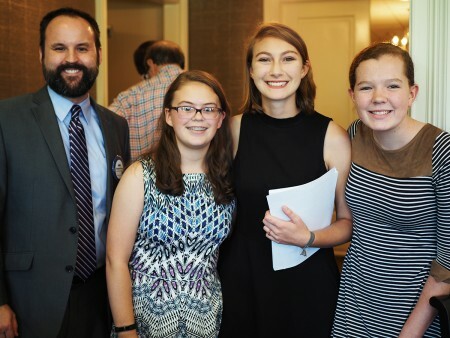 At its September 27 meeting, the Auburn Rotary Club hosted youth leaders from the Alabama 4-H Club’s History Seekers program. Claire Ragan, Elizabeth Jordan and Emmalee Jordan (left to right) discussed the various agricultural and leadership development programs in which area 4-Hers participate. Pictured with these 4-H representatives is Club President Chris Warren. The Auburn Rotary Club meets each Wednesday from noon to 1 p.m. at Saugahatchee Country Club. For more information about the Auburn Rotary Club or how to become a member, visit www.auburnrotaryclub.com.